On Carl Jung, Dreams And Moments Of Visual Inspiration. J.F. Penn In The Dream Network Journal. When I write, I primarily want to provide entertainment and a few hours of escape from the world. But I also bring my obsessions of religion and psychology to the books, along with extensive research to create another level of reading. So I am delighted when readers “get” this side of my books, and I was really excited to do an interview with Russ Lockhart for the Dream Network Journal Volume 32 No 1, Summer 2013. There's an extract below and you can download the whole article as a PDF here. You can also check out the journal, subscribe or buy back issues at Dream Network Journal. RL. Tell me, Joanna, what have been the most important influences on you becoming a writer? JP. Probably the first writer that led me to feel this is what I want do was Umberto Eco, with The Name of the Rose and also Foucault’s Pendulum. Have you read those? JP. I’ve always been interested in religion, and Eco showed me it was possible to write about religion in a fiction book. Trying to write like Umberto Eco obviously was not something I was going to do and that froze me up a bit. But then Dan Brown came along with The Da Vinci Code and Angels & Demons and this made me realize you could write fiction with religion, history, architecture, and archeology, deep and meaningful things, but in a fast-paced way that people would enjoy. Dan Brown helped me decide to write this way. Eco and Brown are two ends of a spectrum. I’m a massive reader and read very widely. In thrillers now, I like James Rollins. He [sometimes] writes from a religious angle. RL. Your ARKANE trilogy is certainly a thriller. The thriller is often described as “escapist” literature, a kind of distractive entertainment from the drudgery of everyday life. I’ve never been happy with this idea of escape. To me, fiction, no matter how great or poorly done, offers a portal of possibilities, an opening into possible worlds, and has the potential of going deeper inside us then we often realize. Are you writing for people to escape or does your fiction have a deeper significance and purpose? JP. I have to say that when I started writing I had a job as an IT consultant. I really was miserable. Reading fast-paced thrillers was all about escape, about how to get out of this commute for 45 minutes before I get to my job and how to fill my lunch hour when I was really down. I’m lucky now. Since becoming a full-time author and entrepreneur, escape isn’t so necessary. But I want to write fiction on two levels, to make people think about deeper things and at the same time to have a really good ride. I will be writing more in my next series and think it is deeper than the ARKANE series. I‘m addressing some depth issues without trying to lecture people at the same time. RL. After reading the name [ARKANE] the first time and [learning] what it meant it was clear you had an interest in Jung and archetypal psychology. How did you get interested in Jung? JP. It was when I studied theology at Oxford. I wrote a paper on psychology of religion and of course Jung was one of the first psychologists I studied. I was particularly taken with Memories, Dreams, Reflections. 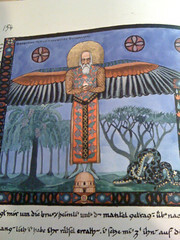 While I was writing Pentecost, Jung’s Red Book was published, his personal journal of breakdown and filled with images. It brought out all the things I had learned about Jung in the beginning of my studies and let me investigate him again. In his life story I found he had been in Tunisia, and in America, and in these places I write about. 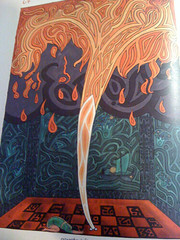 And, in the Red Book there was this painting of the Pentecost flame (as right). That was amazing to me because as I was researching that whole synchronicity idea for the novel, it actually happened to me. What I love about writing these books is that as I research this stuff it seems almost to be true. I just tweak it a bit. It’s fiction, but it’s based on a whole load of facts. RL. One of the things that impressed me was that you would bring in some fact that had just happened—like the story of Arafat’s poisoning—and mix it together with ancient arcane things. This brings together disparate things to create a meaning with a trajectory, not just some far out thing, but meaningful things that get through, that aim beneath the surface. JP. That Arafat story was synchronicity again. And, just the other day, someone emailed me about a show on the Ark of the Covenant. People are always interested in these big archetypal stories. That was part of the reason for writing the books because I wanted resonance with the collective unconscious, the memory we have in our culture around these big religious questions. RL. Do your dreams ever come into your work, or your work into your dreams? JP. I don’t record my dreams as in writing them down when I wake up. I definitely dream richly and I have nightmares. I have quite a dark mind, as you will have found in my books with all those violent deaths and horror aspects. I think the supernatural can be horrific. I like the shadow idea and I like going into the darker side of us and I do sometimes dream very violent dreams. Sometimes, I worry that when people read my books they think that’s me; that I am into violence and death. But part of what’s great about writing is that writing about these dark things helps us reconcile these darker issues. In fact, writers like Stephen King and James Herbert and hopefully me are actually more psychologically normal because we can tackle horror in our work. Does something grip you and that becomes the basis [of the story]? Or do you plan out, outline, and write from there? JP. Oh, the idea or image comes first exactly as you say. I am a very visual person. A lot of my writing comes from the places I’ve been—Israel in particular. I’ve been eleven times. A lot of my passion for these topics comes from things I’ve seen in Israel and other places. Also when I’m researching, things really happen! For example, Pentecost was originally called Mandala and was even more about Jung. Then I was in St. Mark’s Basilica in Venice. I looked up and saw the Pentecost in those golden mosaic stones and this changed the whole book for me. That image. I had the idea for the stones. 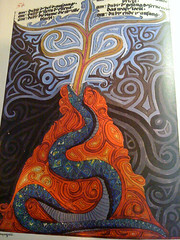 And then I saw the flame coming from the stones in Jung’s painting. This happens to me all the time. The other day I saw on a billboard a man with an octopus tattoo up his back and this image was seared into my mind. I wrote the scene yesterday in my new book. The man has become a woman with the octopus tattoo and she’s become a whole new character. I plot around the images. And then I do research and find nuggets that help to make it more real for readers. You can download the whole article as a PDF here. A huge thanks to Russ Lockhart for a great interview! If you have any questions about anything I have spoken about, please do leave a comment below. Thanks!